"Niagara Falls! Slowly I turned. Step by step, inch by inch." 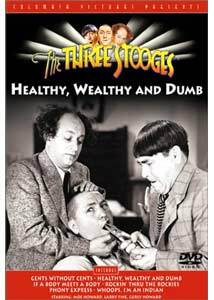 Columbia continues its fine series of Three Stooges shorts on DVD. On this disc, the offering is six shorts, all pleasantly featuring Curly. Gents without Cents (1944) features one of the classic routines of vaudeville, the notorious 'Niagara Falls' sketch. The boys are themselves vaudevillians whose rehearsals are interrupted by the tap-dancing of Flo, Mary and Shirley. They get their big chance when the featured players at a show are delayed. This is the longest of the pictures on the disc, and features plenty of World War II material, including jabs at Tojo, Mussolini and Hitler. The low budget of miserly Columbia magnate Harry Cohn is visible here; even though Larry badly muffs his lines in the Niagara Falls sketch, they apparently didn't have enough money for a retake. Easily the most violent short on the disc, this features one eye poke, three face slaps and a walloping 18 head conks. The title track, Healthy, Wealthy and Dumb (1938), is the first of two pieces here that feature Curly coming into money. In this case, a contest from the Coffin Nail Cigarette Co. brings him $50,000, as well as three golddigging women after the money. One of the staples of the Stooges' routine was food, and this short features one of the best, with glue being substituted for maple syrup with predictable mayhem resulting. Three pokes to the eye, five face slaps and five conks to the noggin. Curly O. Link (the missing Link) stands to inherit a fortune from uncle Bob O. Link in If a Body Meets a Body (1945). This is a fairly pedestrian outing, relying mostly on haunted house gags, featuring an extensive sequence with a parrot inside a skull. The weakest short on the disc, it serves up only one eye poke, two slaps of the face and nine cracks to the skull (not the parrot's--nyuk nyuk nyuk). The remaining three shorts feature the Stooges out in the Old West; in all three Curly wears a skunkskin cap. They start off as guides in Rockin' thru the Rockies (1939), leading a troupe of girls, Nell's Belles, from Missouri to San Francisco. Any expedition featuring Larry, Moe and Curly as guides is obviously doomed, and they not only manage to get lost, but lose the horses and attract the attention of Indians who have designs on the women. Curly is quite wild here, spending much of the running time barking like a dog. A comic ice-fishing sequence is the highlight of this short that lacks any eye pokes, but has three eye slaps and an unhealthy 15 raps to the cabeza. Phony Express (1943) finds the boys wandering into Peaceful Gulch, where the Red Morgan gang is raising havoc. An enterprising soul prints a notice in the paper that Wild Bill Hiccup is coming to clean up the town, utilizing a wanted poster of the Stooges as illustration. When the gang finds out about the ruse, they're plenty mad, and the Stooges need to redeem themselves by bringing in the gang. Not one of the group's better films, it does feature three pokes to the eye in addition to one measly face slap and fourteen blows to the head. One of the funnier shorts here is Whoops! I'm an Indian (1936), which starts off with the boys cheating the locals at games of chance. When they're found out, they need a disguise quickly, and dress as Indians. However, they don't count on Pierre, whose wife left him for an Indian, and he's ready to kill any he sees. Curly has a wild time as squaw Laughing Eyebrows, especially when he finds himself getting married to Pierre. There's plenty of mayhem and comedy despite the rather low violence total of one eye poke, five face slaps and four conks to the skull. While not the Stooges' best work, there are more laughs here than in any dozen modern full-length comedies. Curly in particular has amazing versatility, timing and comic genius for sound effects and physicality. It's hard to go wrong with a disc of six Curly shorts, and this one's well worthwhile. Image Transfer Review: The original full-frame transfers look quite good. In contrast to the earlier volumes in this set, the shorts, for the most part, look pristine. There is plenty of detail and a very attractive black & white picture. Occasional speckling can be seen, but no major frame damage at all. Gents Without Cents appears to be slightly cropped, since the 'N' of 'Noazark Ship Co.' is cut off at the left of the picture. Otherwise, these pictures look the best I've ever seen them. Either Columbia did some restoration, or they had some gorgeous masters packed away. Audio Transfer Review: The 2.0 mono sounds quite good as well. The sound doesn't suffer from hiss, noise or distortion. There is obviously a somewhat tinny sound to the music, but the dialogue is clear throughout. The Portuguese language is available only on the first two shorts. Extras Review: Other than several different subtitle languages available, there are no extras to speak of. There are some annoying animated menus that simulate slot machines for no good reason, and each short gets but one chapter to its credit. Nor is there a 'Play All' option, which would be nice. The Stooges never get any respect. Six—count 'em six—Curly Classics, presented in beautiful transfers. No extras, but plenty of laughs to be had.